Judas Thaddeus, called Jude to distinguish him from Judas Iscariot, is often regarded as the brother of the Apostle, Saint James the Less. Other than a mention in the listing of the Apostles in the Gospels, there is only one reference to Jude anywhere in the New Testament. At the Last Supper, Jesus tells the Apostles that he will reveal himself to them. 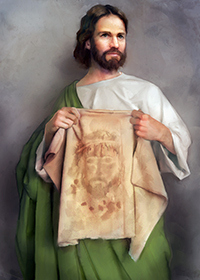 Jude then asked him, “Master, what happened that you will reveal yourself to us and not to the world?” Jesus answered and said to him, “Whoever loves me will keep my word, and my Father will love him, and we will come to him and make our dwelling with him.” (Jn 15:23). There are some rich traditions and some conflicting accounts about Saint Jude which have come down to us over the centuries. One of the stories comes to us from Eusebius, an early Church historian. It concerns a young Middle Eastern prince, Abgar, who had written to Jesus during his ministry. Abgar invited him to come to visit his domain, a small principality in present day Iraq. Declining the invitation, Jesus, promised to send one of his disciples instead. So, after the Ascension, Jude made his way to Abgar’s capitol, Edessa, where, he learned that Abgar was dying from an incurable disease. As was the custom at the time, when Jude arrived in this new, unevangelized territory, he first preached to the Jews of that territory while staying at the house of one of the Jews, Tobias. When Abgar heard about the wonders which Jude was performing, he sent for Tobias and asked about Jude. Believing this to be his messenger from Jesus, he asked that Jude call on him. In speaking with Jude, Abgar became convinced that Jude was sent by Jesus and told him of his own faith in Jesus and his Father. Jude then cured Abgar and went on to convert many in the principality. Jude later went into Armenia where he preached and then, with Simon the Zealot, into Persia (Iran) where they made many converts. It was here that the two Apostles met their martyrdom by being stoned to death. Saint Jude is the patron saint of lost causes and hopeless cases. Many minor as well as major miracles have occurred through his intercession. The entertainer, Danny Thomas, was out of work for a long period before praying to Saint Jude. Soon after that prayer, he found work. Several years later, in thanksgiving, he endowed Saint Jude’s Children’s Hospital where modern miracles take place on a routine basis. Because of their common martyrdom, Saint Jude and Saint Simon share a feast day on October 28. Jude's message today: In a vision to Saint Bridget of Sweden, Jesus noted that Jude would “show himself most willing to help.” Many people who have called on Saint Jude, like Danny Thomas, have found work after extended unemployment. Others with terminal illnesses have recovered after turning to Saint Jude. When you have reached the end of your rope and all seems lost, say a prayer to Saint Jude. He will help you too.